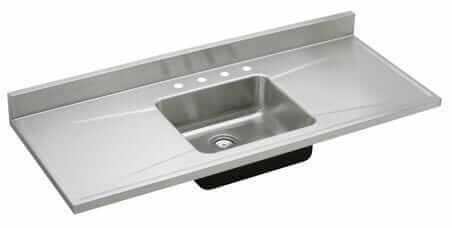 Are you looking for a vintage kitchen drainboard sink, want to choose from a huge selection, and get one fast? Ken and his wife are here to help: Based in Gardner, Mass. (near me! 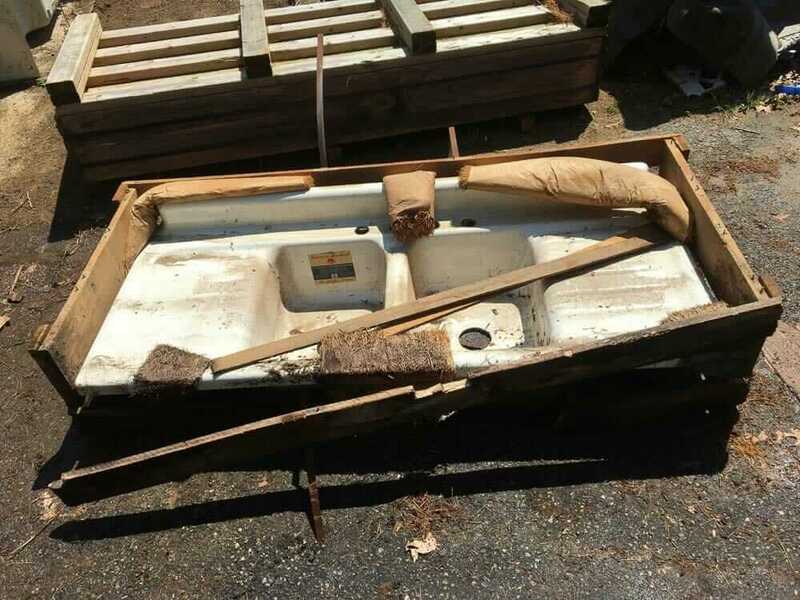 ), they scour New England and beyond for vintage sinks in original condition (no refinishing!) and at any given time, have 150 vintage kitchen sinks in stock. And they are: BEAUTIES. Oh my word, these old sinks are gorgeous! I’ve received messages from Ken over the years. He is a reader of the newsletter and occasional commenter on the blog. But my bad, I have not pounced to find out his story. I recall that’s because his website does not tell the story, which slowed me down. It shouldn’t have! Ken does things old skool: You find him and he emails you photos. He sent me a big file showing a bunch of the current inventory. Begin drooling now. 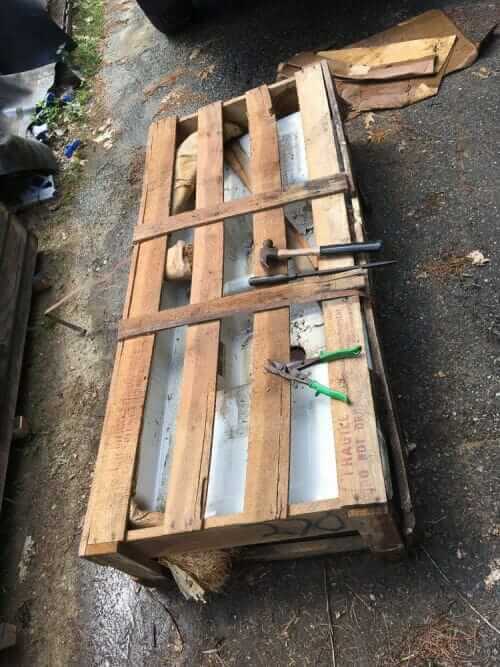 The photos above: That’s Ken with a New Old Stock American Standard kitchen drainboard sink found in its original shipping crate. Generally, in our world, things don’t get much more exciting than that. 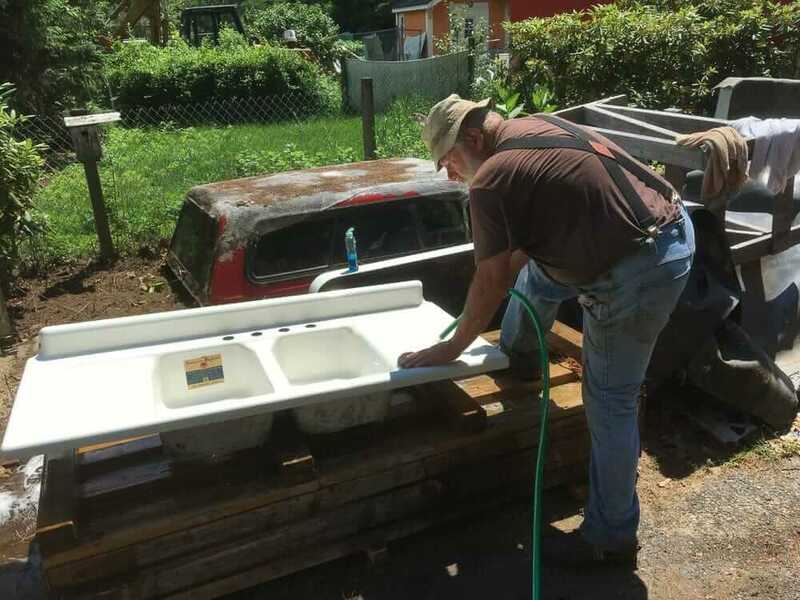 But wait til you see some of the other sinks look for a loving new home — they’re pretty darned exciting too. Ken and I had quite a few emails back and forth… I edited them for flow. Some sinks shown have been sold, but there are dozens more here not shown on e files. Vintage kitchens is my thing. I specialize in sinks. Very good to museum quality and some NOS! I also have stoves, refrigerators, chimney cabinets, butcher blocks, porcelain tables etc. 150 sinks here on an average at all times. I am always hunting for nice sinks that are unique in style, size or color. I do not sell refinished sinks! 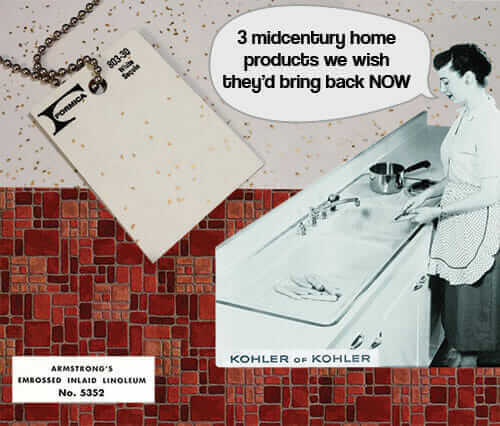 In 2000 my wife and I started hunting for vintage kitchen items for our own kitchen. Our goal was to convert our home which was built in 1970, to look as if it were built/furnished in the 1930-40 era. I liked so many different stoves that we found, that I began to collect them for my own enjoyment. 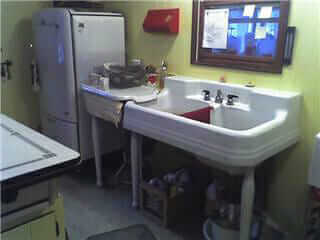 Then I set up a display and began adding vintage kitchen sinks, refrigerators and Hoosiers. After a while I decided to turn it into a paying hobby so that I could sell some items that others may be searching for and buy other items for my collection that I did not already have. We love all of the old appliances and furnishings. I am always excited to find another nice sink or appliance that is of a different style or special color. Yes, special color. Not only do we have sinks for example that are white, but we have yellow, mint/ming green, pink, brown, peach and even orchid! The early stoves were available in many of these special colors as well. We hope that we can help you put together your own vintage kitchen that you can enjoy as much as we enjoy ours. Rare bathroom fixtures occasionally creep into the inventory too — like this Lavendar / Orchid suite. But, Ken, says this happens rarely — bathrooms have so many pieces, he does not collect them. Refinished sinks: The porcelain found on these cast iron sinks is a form of ceramic, furnace fired, glass finish. Real porcelain is extremely hard and durable. Refinished sinks are typically not done in new porcelain. They are painted! It may be called epoxy, powder coated or reglazed, but it is still paint. It will not endure many years of serious kitchen use as the ceramic porcelain does. So our sinks are original porcelain finish, yes, even the colored ones. I have heard this too — that is, reglazing a kitchen sink may not be satisfying longterm due to the daily abuse; do your own research, dear readers. And, re old sinks in general: Precautionary Pam reminds: Be aware, dear readers, that old sinks, tubs, ceramic tile, etc. may contain lead. See my story here. Get with your own professional to assess what you are working with — Be Safe / Renovate Safe. 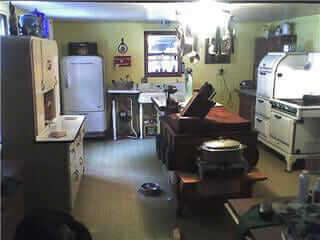 Ken’s kitchen with vintage Richmond kitchen sink. He switches things up. 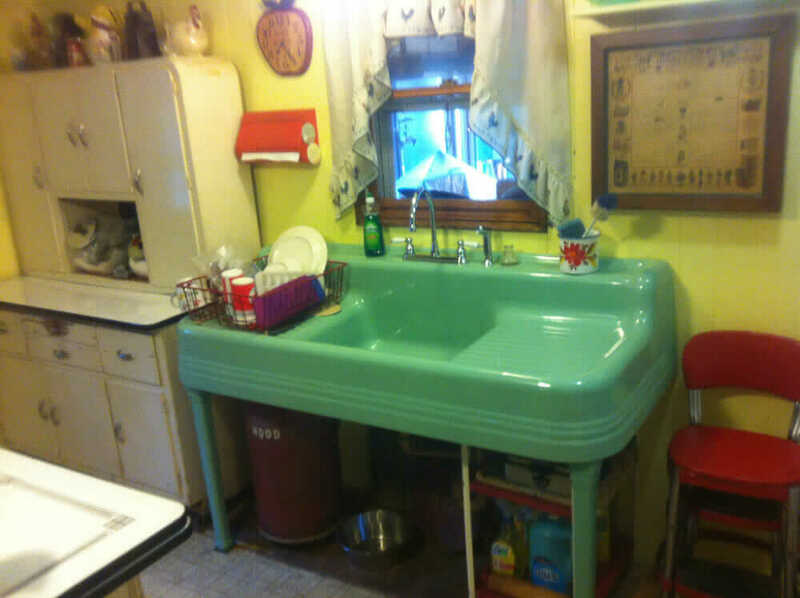 Ken’s kitchen with green deco sink — oh my! Notice the Mountaineers spice rack — one of my faves! Pam, I have a web site that I am unable to keep up photos on, GrampasAntiqueKitchen.com. When people inquire about a sink, I ask them to be specific as they can as to size, style, color etc. I then forward the appropriate albums dedicated to their needs. As your friend found me, I also place ads throughout the country on various Craigslist. I have been in magazines etc. I also try to give helpful advice on sink care etc. on different site which people than can then see my name. There is not basic price. Certainly not a bargain basement here. I have exceptionally nice sinks (and my standards are higher than most of my customers). I spend a large portion of my daily life hunting down nice sinks every where in the country. I have made long distance trips to buy multiple sinks at one time on occasion. I recently I drove roughly 2,000 miles to buy three sinks. The first was in Lancaster, PA… then Ohio on the West Virginia border along the Ohio river. 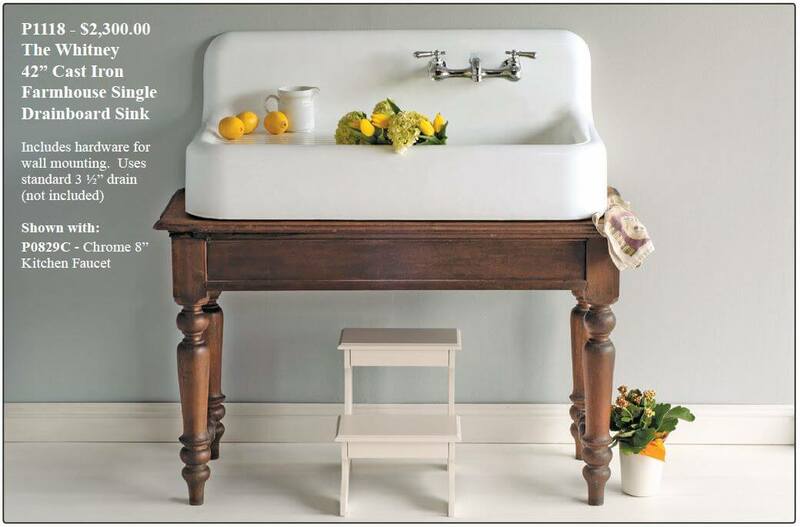 The last stop was a very almost cute 20″ Butlers sink in New York. Several years ago I made my longest buying trip, to Winnipeg, Manitoba, Canada — 3,600 miles round trip to buy a rare six- burner electric stove from the 1930s era. That was roughly eight years ago. That one is still waiting for restoration. 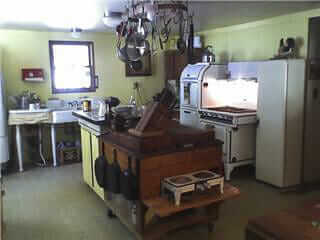 I drove to Chicago about 10 years ago to pick up a 60″ farm sink and a 6 burner gas Magic Chef 6300 model stove. I had purchased both on eBay from different sellers. While picking up the stove I also bought the sink from the same house that I did not previously know about until I arrived there. Note: That stove and sink came out of a $4.5 million dollar fixer upper! Yes, $4.5 million, and when I got there the house was gutted for remodeling. At that point I had more cargo than would fit in my truck bed so I went and rented a U-Haul trailer to bring things back to Massachusetts! I just recently sold that sink to a couple from Connecticut. They liked the sink so much that they have invited me to their wedding this year! Ken is going to receive a Retro Renovation “The Hard Way” Lifetime Achievement Award this year! Them’s a lotta miles. And: Getting invited to customers’ weddings? I love it!! The sinks most sellers call very nice, exceptional, mint etc. I go to see and they are far less than described. Sellers’ eyes do not seem to be as keen as a buyers’ eyes! I.e worn-out or worn-off porcelain, large chips, three-foot=long gouges in the porcelain from being dragged across the floor on nail heads or across the driveway! etc. This is often done after pictures are sent and by careless workers or people too lazy to actually carry the sink out. 1800’s -early bar sink. Nickel over copper, most of the nickel is long gone. Great patina as is, polish or nickel plate again. Newer faucet should be replaced for authentic one. Condition, rarity of configuration or color or original attachments like legs, pull out compost or potato canisters, some even had electric dish washers and clothes washers built in!! Some are only good enough (in my opinion) for garden potting sheds or summer kitchen etc. These may be $100 or so. Some are priced in thousands. This vintage Richmond kitchen sink was in Ken’s kitchen at one point — later sold to a buyer in Calif. This ming green tandard vintage kitchen sink is now in Ken’s kitchen. The sink in my own kitchen I paid near $2000 for and bought it in St. Louis! That is my current kitchen sink. It is quite rare and the only one of seen in any color at all including white. 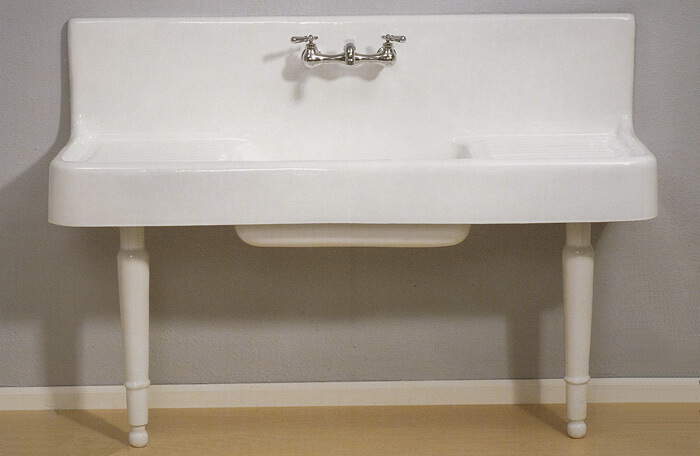 Another rarity of it is that is was made by the Standard Co. which typically made a more basic sink. I don’t see much for Standard Co. art deco designs. I love what I do and happy to see these vintage items being reused. I like getting pictures of the things I sell installed in their new homes. Check the site called Houzz.com. 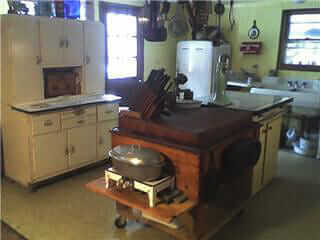 I have a page on that site Grampas Antique Kitchen, you can see several reviews from customers there from all over the USA. Thank you, Ken — what a fascinating fascination you have with all these fantastic old sinks! It is so nice to see them saved, treasured, and put to renewed use for — what? — like FOREVER if folks take care of them! I am laughing my tail off right now. I saw an ad on our local Craig’s List for “Cast Iron Griddle – Iron Skillet”, and saw a slew of pictures that blew me away–one monitor top fridge in particular. I didn’t have time then to try to figure out whether there was a shop, or if this was someone doing business out of their barn or what, but I bookmarked the ad for later. This morning, I found myself looking for 1930s references again for our bungalow, and found this page that I somehow missed back in April. Guess where I live? Same town. The ad I saw was his. J-881-42. It’s in good condition. I cannot find one on line,so, was hoping you could help me out with its value and if it was manufactured in 1927. I know that indoor plumbing was beginning to be a thing in the 20s and, most likely, in the wealthiest of households. Crossing my fingers you will help me and that it’s a rare piece. Hi Karen, I’m not an expert on this subject….